Some how, back in February of 2006, I found out about Continuous Ink Systems (CIS) and begin my search. I came across a man selling what I deemed to be a good system to try on E-Bay, and through a few emails, discovered he lived just up the street from me. I bought my first CIS from him within a week. 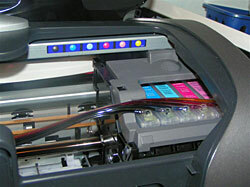 A CIS supplies “phony” cartridges with ink continuously from large reservoirs out side the printer with silicon tubing. The average home printer cartridge holds only 8-15ml of ink, and the CIS I bought comes pre loaded with 100ml of ink in each color container. That’s a lot of cartridges worth of ink! I took a chance getting this system as I realized this very important truth. The Ink cost as much as the printer, so I am only out the cost of the CIS, as the printer is pretty much disposable. It is a bloody shame, but true for most entry level photo printers. Just read some of the replies to this site, that claims someone did the math, and realized that if one were to fill an Olympic sized swimming pool with ink from cartridges, it would cost 5.9 BILLION DOLLARS! I just bought a new printer instead of buying ink. Yeah, I threw away a perfectly good printer, but hey… I’ll be throwing away another perfectly good printer in a couple months when it runs out of ink too. Saves me about $20 that way. – Took one look at the price of Ink for it – and went to Staples and bought a Laser Jet the day it ran out of ink. Anyhoo – I have refilled it 5 times now, and have printed almost 2000 full color almost full page 8.5 x 11 highest quality prints on high resolution ink jet paper, and over 300 8.5 x 11 borderless glossy photo prints. Believe me when I tell you each new photo print looks like the first. Bright crisp, sharp and colorful. Totally awesome black levels and blinding colors!! Mine is an isobarically balanced system, requiring no priming or needles. It’s a 5 minute set up. 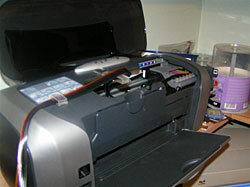 I believe I have saved over $2000.00CAD between my 3 printers so far. A note about the ink- The Epson R200/300 series and the 1280 use Dye ink. It is not waterproof, and may not last longer then 10-15 years without fading. The CX7800 uses Durabrite ink, which is pigment based and is archival- 50+ years, water resistant, fade resistant. This archival ink is very expensive, and hard to come by in bulk. So if you are happy with a print that is truly photo quality, but may not last forever, the CIS is for you. For text, it is actually cheaper than a laser printer. Probably less than one cent worth of ink per page. 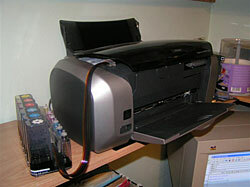 It is a photo printer, so I suggest the use of a laser printer if all you do is text. They are built to last longer, and fewer moving parts. If you buy a brand new printer for $129 and a CIS for $79, your first 300 full page photos on photo paper cost only .84¢ each. That’s a sweet deal compared to some places that want $5 for an 8×10. Even Wal-Mart and Costco here in Toronto want $2.99. 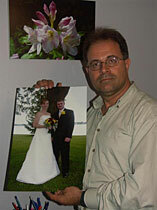 Here is a shot of me holding a picture I took and printed of my brother in laws wedding on my 1280 printer. I am standing in front of another picture I printed and had plaqued. I figure the large pictures cost me maybe forty cents in ink. The paper I have I got on sale for forty five cents. I buy generic paper made in Toronto for about a dollar sixty otherwise. Still, under two bucks for a 13 x 19! So you see that at least having cartridges refilled is not just cost effective, but environmentally responsible as well. Every time a full page 8.5″ x 11″ photo rolls off the printer at a cost of less then .35¢. Even Costco and Wal-Mart charge $2.99 for an 8×10! THIS IS BIG NEWS!! My 13″ x 19″ prints cost me under $2.00 if I buy paper at club prices (http://ccbc-club.com) and I scored some paper for under .50¢ per sheet so I am under a buck for a large print! Darn! This is not rocket science – it is down to earth economics! 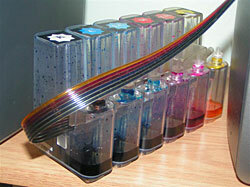 Do you want to pay $100 for a new set of cartridges or $80 for 10 sets of equivalent ink? * March 4th update – 2007 To date I have helped 3 friends get CIS and 2 more have just bought Epson printers and are ready to be hooked up. This article was contributed by Rudi Jock – who in additions to his photographic skills – sees the “big picture” and helps save money on the final printed image. He also has a great website, and here is the direct link to his CIS page. I have a CIS, and I have loved it, but I have a hard time finding a printer that will keep working. My understanding is that you have to have a printer that has ink cartridges that are stationary…so, I found 2 old HP Officejet Pro All-in-one’s on craigslist…they both did wonderfully for awhile, but are now not working. I want to keep using the CIS, but I have to find a reliable printer. Do I see correctly that yours is working in a printer that has ink cartridges that move back and forth??? What printer do you recommend? Thanks so much!! 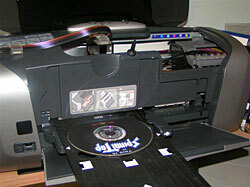 Can I buy a cheap cis (see below) and push the pipes into my existing HP 7520 Photosmart cartridges? Do I need to have replacement cartridges (with or without chips) ? For this cheap CIS system, the cartridges are not compatible with HO 7520 Photosmart. Perhaps, at the printer end, the plastic pipes are glued to the cartridges ? Thanks for sharing being a Experience here, I learn lot, How Could you reduce the http://www.asapinkjets.com Refilling ink time to time from Ink system, its Great technique to improve. Shop.re-inks.com for more About the CIS..